Located in Council Bluffs, Iowa, this hotel features on-site dining at 3 restaurants and free high-speed internet access. The Horseshoe Casino is a short walk from the hotel. The Hilton Garden Inn Omaha East/Council Bluffs features rooms with a flat-screen LCD TV and an iPod docking station. A microwave, a mini-refrigerator and a coffeemaker are available in each room. An indoor pool and a fitness room are on-site at the Council Bluffs Hilton Garden Inn Omaha. The hotel offers on-site laundry facilities and room service. A gift shop is available at the hotel. The Omaha Henry Doorly Zoo and Rosenblat Stadium are minutes from the Omaha Hilton Garden Inn Council Bluffs. The Joslyn Art Museum is also a short drive from the hotel. This hotel in Omaha, Nebraska is connected to the Ameristar Casino and offers a free daily hot breakfast. All guestrooms feature signature Cloud Nine beds. Guests staying at the Hampton Inn Council Bluffs are provided with a variety of thoughtful amenities, including free high-speed internet access. The hotel also offers an indoor swimming pool as well as an on-site fitness center. Local points of interest, including Horseshoe Casino, the historic Old Market District and the Henry Doorly Zoo can be found only a short drive from the Council Bluffs Hampton Inn. The Qwest Convention Center is also located nearby. Located just off I-29 and across from the Mid-America Center, this Holiday Inn Express features a spacious indoor pool facility. Free Wi-Fi and a daily hot breakfast buffet are available. The Holiday Inn Express Hotel & Suites Council Bluffs – Convention Center Area offers sophisticated rooms with a 32-inch flat-screen cable TV and coffee maker. A refrigerator and work desk are included. A whirlpool and on-site fitness center are open for all guests of the Holiday Inn Express Council Bluffs. A business center and laundry facilities are also available. The Convention Center Area Holiday Inn Express is 1 mile from the Ameristar Casino and 12 minutes from the Lauritzen Gardens. This Council Bluffs hotel features an indoor pool, continental breakfast, and rooms with refrigerators. Quest Convention Center and Omaha Eppely Airport are both within a 10-minute drive of the hotel. The Quality Inn and Suites Council Bluffs offers guest fax and photocopy services as well as laundry facilities. Also provided is a free airport shuttle to the Omaha Airport. Each guest room at the Council Bluffs Quality Inn and Suites includes a coffee maker and ironing facilities. Cable TV and free Wi-Fi are also offered. This Council Bluffs hotel is within a 5-minute drive of Jefferson Square and the Joslyn Art Museum. Henry Doorly Zoo and Omaha Botanical Gardens are a 10-minuted drive away. A completely non smoking property, SpringHill Suites offers modern accommodations less than 10 miles from both Council Bluffs and central Omaha. It features an indoor pool with jacuzzi and a well-equipped gym. Rooms at SpringHill Suites by Marriott Council Bluffs have a spacious outlook and custom-made beds. They all include free Wi-Fi, flat-screen TVs and iPod/Mp3 docking stations. Guests can enjoy a hot daily breakfast, served at the restaurant of the hotel. There is also a bar, serving refreshments and drinks until late in the evening. During the warmer months outdoor dining is possible thanks to barbecue facilities. Popular nearby attractions include Council Bluffs’ Haymarket historic district and Lincoln Memorial, both within 4 miles from the SpringHill Suites by Marriott. Free parking is available on site. This Council Bluffs hotel is within a 15-minute drive of downtown Omaha and 7 miles from the Eppley Airfield. The hotel offers an indoor pool, jacuzzi, gym and business center. Comfort Suites Council Bluffs rooms include a microwave and refrigerator. The rooms are equipped with free Wi-Fi. The Comfort Suites is 3.5 miles from Creighton University and the Henry Doorly Zoo. The Omaha Botanical Gardens are 5 miles from the hotel. This hotel is in Council Bluffs, at the junction of Interstate 29/80 and Route 192. It has an indoor pool, and offers air-conditioned rooms with free Wi-Fi, and a flat-screen TV. Rooms at the Fairfield Inn Council Bluffs include modern furnishings and a work desk. They come equipped with a desk, coffee maker and a private bathroom. In the morning the Fairfield Inn serves a continental breakfast with fresh fruit and cereal. The hotel provides a dry cleaning service, and has safes at the front desk. Dodge Riverside Golf Club is 1.5 miles from Fairfield Inn Council Bluffs. The Henry Doorly Zoo is 5.5 miles away. This Omaha, Nebraska motel features an indoor pool and guest rooms with expanded cable TV. Motel 6 Council Bluffs is 4 miles from Henry Doorly Zoo. Guest rooms provide telephones. Wi-Fi is available. Council Bluffs Motel 6 offers guests laundry facilities and free local calls. Motel 6 is 2 miles from Horseshoe Council Bluffs Hotel & Casino and 4 miles from Rosenblatt Stadium. It is 6 miles from Omaha Botanical Gardens and 9 miles from University of Nebraska at Omaha. This Nebraska hotel is 3 miles from Omaha’s Henry Doorly Zoo. Days Inn Council Bluffs/9th Avenue serves breakfast and offers guest rooms with free Wi-Fi and cable TV with HBO. Rooms provide seating areas and safety deposit boxes. They also include hairdryers and coffee makers. Council Bluffs/9th Avenue Days Inn has laundry facilities and offers guests free passes to a nearby gym. Council Bluffs Days Inn is a half mile from Harrah’s Council Bluffs Hotel & Casino and Dodge Park Golf Course. It is 4 miles from Omaha Botanical Gardens. Conveniently located close to the intersection of Interstates 29 and 80, this Iowa hotel is just 2 miles from Harrah’s Casino. A daily continental breakfast is served and each guest room includes a flat-screen cable TV. Ironing facilities and a work desk are available in every room at Microtel Inn & Suites by Wyndham Bluffs. 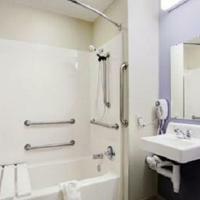 Suites have a kitchenette and sofa bed, and each private bathroom includes a hairdryer. An indoor pool is available on site at Bluffs Microtel Inn & Suites by Wyndham. Free Wi-Fi is available throughout the property and a fitness center and business center are open to all guests. Dodge Park Golf Course is a 5-minute drive from this hotel. Downtown Omaha is only 10 miles away. This Council Bluffs hotel, located just off Highway 80, features modern rooms equipped with a 32-inch flat-screen TV with HBO and free Wi-Fi. Facilities include an indoor pool and sauna. All warmly decorated rooms at the AmericInn Council Bluffs include a microwave, refrigerator and coffee maker. A spacious work desk is provided and all bathrooms boast granite countertops. Guests of this hotel can enjoy a daily breakfast. Other on-site facilities include a fitness room and business center. The Council Bluffs AmericInn is within walking distance of Mall of the Bluffs and Union Pacific Railroad Museum is 2.5 miles away. Henry Doorly Zoo is just a 12-minute drive from the hotel and Omaha-Eppley Airport is 11 miles away. Located adjacent to Dodge Park Golf Course, this hotel and casino is a 6-minute drive from Creighton University. It offers a free airport shuttle, multiple on-site restaurants and rooms with free Wi-Fi. A 32-inch cable TV and a golf or river view are featured in all rooms at Harrah’s Casino & Hotel Council Bluffs. In-room coffee and a hair dryer are provided for guest convenience. Dining options at the Council Bluffs Harrah’s include fine dining on the 12th floor at 360 Steakhouse. A 24-hour diner and buffet restaurant are available. Stir Live and Loud nightclub is open Wednesday through Saturday with live weekend entertainment. Fitness facilities and room service are offered at this hotel. Souvenir shops and a tour desk with ticket assistance are also available. This hotel is a 6-minute drive from Harvey’s Recreation Complex, and a 10-minute drive from Lake Manawa. Shopping at Metro Crossing is just 5 miles away. Located off Interstate 80, this motel is less than a 5 minute drive from Mall of the Bluffs. It features an indoor pool, a daily continental breakfast and pet-friendly rooms with free Wi-Fi. A cable TV and a work desk are provided in each room at Western Inn. The simply styled rooms also offer a private bathroom and a clock radio. Council Bluffs Western Inn is a 10 minute drive from Henry Doorly Zoo and Ameristar Casino. Lake Manawa State Park is about a 15 minute drive away. Just off Interstate 80, this Iowa hotel is less than a 15 minute drive from downtown Omaha, Nebraska. All rooms come with free Wi-Fi and a cable TV. A work desk is provided in every room at American Inn Council Bluffs. Each air-conditioned room includes a telephone. The front desk is available 24 hours a day at Council Bluffs American Inn. A laundromat is featured on site for guest convenience. The Mid America Center is one mile from this hotel. Horseshoe Casino is less than a 10 minute walk from the property.